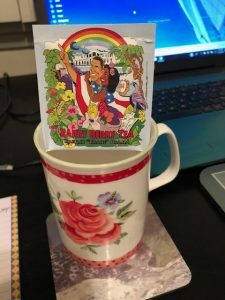 Barry Berry Tea, Barack “Tisane” Obama Herbal Tea (PoliTEAcal Series) is a Must-Try! Today was Voting Day! It is also a day that I thought about past Presidents and today’s President. Everyone has their own opinion and are entitled to their own opinion…so I don’t often discuss politics on my blog. But, I was quite excited to hear about the Barry Berry Tea from The Tea Book. I am a big fan of their teas and this one definitely didn’t disappoint! 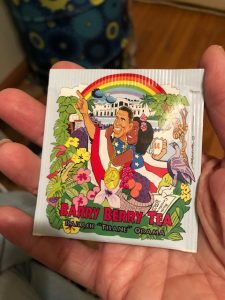 It is a sweet berry taste and I just love the cartoon picture of President Obama and former first lady Michelle Obama. I also love that it is herbal and has no caffeine so I can drink it at night. You just have to check out their site because they have some really other cool Teas! I actually already know which one I will be purchasing next! It comes in a Peach Mint flavor! Yum! Self Disclosure: I received free or discount samples to facilitate this post. But, any opinions expressed are my own.